2,000+ entertainment channels and counting. By far the most movies, sports, news, music and kids' shows of any streaming player. Control with remote or mobile. You can choose to control your entertainment via your iOS or Android device. Or use the included remote that everybody can share. It's your choice. 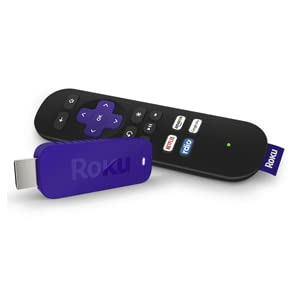 Plug in, and start streaming loads of entertainment to your TV with the Roku Streaming Stick. Enjoy 2,000+ channels with the most movies, TV episodes, music, news, sports, kids" shows and free programming of any streaming player all in up to 1080p*. 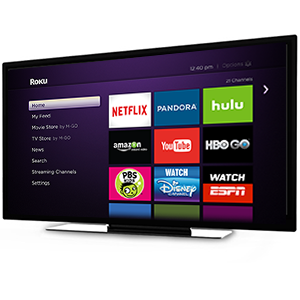 Control your entertainment from your smartphone with the free Roku app, or use the included remote that everyone can share. Even cast videos from mobile apps, such as Netflix and YouTube, from your phone straight to your TV. And with features like one-stop search**, channel shortcut buttons, and extended-range wireless, you'll fall in love with the simplest, speediest streaming experience out there. 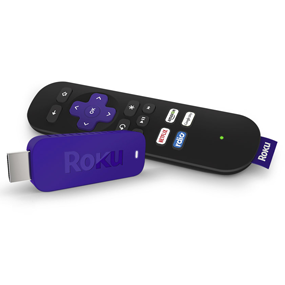 The all-new Roku Streaming Stick-it's the stick that streams the most. *Availability of 1080p HD video limited by channel provider and speed of broadband connection. ** One-stop search is for movies and TV shows and does not work with all channels. Subscription may be required to access some channels. The biggest streaming channel lineup. Access to 300,000+ movies and TV episodes on demand. The widest selection of free, subscription, and rental channels. Though, some channels require payment method to access and channel availability is subject to change. Not all content is available in all countries. Fits perfectly behind wall mounted TVs. Includes Enhanced remote with channel shortcut buttons. More channels than any other streaming player. 2,500+ channels. Watch what you love. Pay only for what you want. No wires, no fuss. Compact design fits behind just about any TV with HDMI. Rich, vibrant video streaming with up to 1080P HD. Beam photos, songs, and videos from your phone or tablet to your TV.